It's an exciting time to be a fraternity guy in college, isn't it? 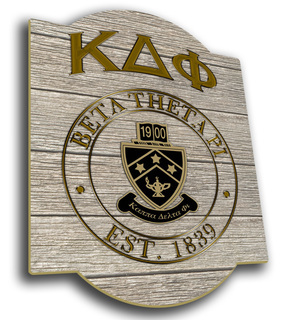 This year, make sure that your chapter has plenty of professional promotional materials for your events, including Kappa Delta Phi Signs, Flags and Banners. A sign is a way to welcome people to your fraternity and make them more curious to learn what you're all about. For instance, when you personalize the KDP Banner it will feature your 1900 founding year, the fraternal symbols, name and one more piece of pertinent history of your choosing (like the All For One, One For All motto). A sign is also decorative and helps you make your home or dorm room look more interesting. For instance, the House shaped Sign is made with a black and gold gradient design and features your letters at the center. Hang it on your front door or in your front window. The colorful Display Sign might fit above your dorm room door or over your bed. 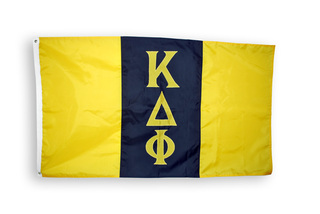 You'll be pleased and satisfied with the colorful array of choices we have available in this section dedicated to Kappa Delta Phi Signs, Flags and Banners. 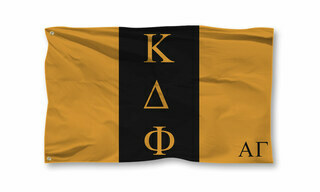 We also have KDP spirit items, party favors and other recruitment merchandise for sale at Greek Gear. 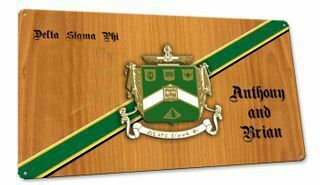 Kappa Delta Phi Signs & FlagsThe Greatest Selection. Period.